Over the past year, we’ve noted an upward trend in customer concerns regarding the challenges they are experiencing with homeless individuals loitering, camping, or using facilities and amenities without authorization. You may find it surprising to learn that in 2015, out of all other cities/counties in the nation, San Diego City/County ranked as having the 4th largest homeless population, according to the Annual Homeless Assessment Report published by the U.S. Department of Housing and Urban Development. The Assessment estimates that there are nearly 9,000 homeless in our area. These statistics are troubling, to say the least, and the lack of accessible shelters and public housing partly explains in many instances why we see homeless individuals seeking refuge on private property. What is Trespassing in California? **Note: If the individual refuses to leave after being asked to do so, or subsequently returns to the property after being asked to leave, a trespass violation exists. If an individual voluntarily complies to leave after being asked to do so, a trespass arrest is typically not possible unless other crimes have been committed. What else can you do to deter homeless trespass? 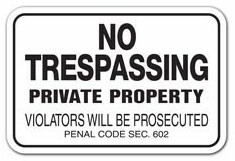 Posting your property properly with “No Trespassing” signs, citing section 602 of the Penal Code, is helpful. Post them at the entrances to your property, pool facility gates, and at other major recreational areas, if applicable. A property that is appropriately posted aids in the prosecution of trespass to prove “intent” in committing the crime. Lock and secure dumpsters and recyclable receptacles after hours. Avoid allowing trash, shopping carts, or personal belongings from being accumulated on the property. Promptly have such removed. File ‘Letter of Agency’ authorizations with your local law enforcement that will authorize them to arrest for trespass on your behalf. Employ a private security service to conduct patrols through your property. Most individuals will move along to other areas to camp after they realize they are being inconvenienced too many times in being directed to leave. What do you do if you see an unauthorized person on your property? You can either phone the police, your security service, or you, as an owner or owner’s agent, can ask the individual to leave. Never place yourself at risk, and do not insert yourself into a situation that has the potential to be dangerous. If the individual in question appears to be combative or violent, immediately dial 911, and then phone your security service. North Coast Patrol is committed to assisting you with such challenges. If you have any questions, or would like to brainstorm solutions for your particular situation, please don’t hesitate to contact me.